The definitive text in the field, thoroughly updated and expanded Hailed by professionals around the world as the definitive text on the subject, Cold-Formed Steel Design is an indispensable resource for all who design for and work with cold-formed steel. No other book provides such exhaustive coverage of both the theory and practice of cold-formed steel construction. Updated and expanded to reflect all the important developments that have occurred in the field over the past decade, this Third Edition of the classic text provides you with more of the detailed, up-to-the-minute technical information and expert guidance you need to make optimum use of this incredibly versatile material for building construction. Wei-Wen Yu, an internationally respected authority in the field, draws upon decades of experience in cold-formed steel design, research, teaching, and development of design specifications to provide guidance on all practical aspects of cold-formed steel design for manufacturing, civil engineering, and building applications. Throughout the book, he describes the structural behavior of cold-formed steel members and connections from both the theoretical and experimental perspectives, and discusses the rationale behind the AISI design provisions. 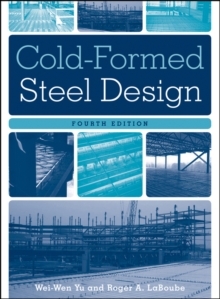 Cold-Formed Steel Design, Third Edition features complete coverage of: * AISI 1996 cold-formed steel design specification with the 1999 supplement * Both ASD and LRFD methods * The latest design procedures for structural members * Updated design information for connections and systems * Contemporary design criteria around the world * The latest computer-aided design techniques Cold-Formed Steel Design, Third Edition is a necessary tool-of-the-trade for structural engineers, manufacturers, construction managers, and architects. It is also an excellent advanced text for college students and researchers in structural engineering, architectural engineering, construction engineering, and related disciplines.